Chuck Burke was Senior Vice President and COO of NCS. In his three years here, he made a huge positive impact on the company and its national reputation, as well as on the daily lives of everyone in our office, and anyone in our industry who worked with him. Many will remember Chuck from his 30 years as COO at Credit Bureau Associates (CBA) in Cherry Hill, NJ, where he headed all aspects of operations for the Experian affiliate including the IT Department. 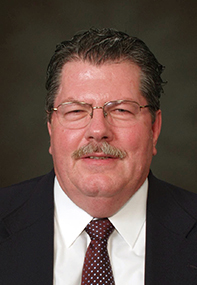 His work with CBA's system services was well known and respected nationally. Upon CBA’s acquisition by Experian in 2003, Chuck continued his leadership as Experian's Director of Operations – Real Estate Division. He led the Division, which included all aspects of IT and Operations, until its acquisition by First Advantage CREDCO in December 2003. As CREDCO's Director of IT and Product Delivery, he made his presence known by overseeing maintenance of all corporate security IT policies. His unique application of numerous safeguards and redundancies during four years there led to a 99.8% system reliability rating. His overall accomplishments at CREDCO increased profitability by reducing the completion time of new product rollouts by 50%. Due to a period of consolidation at CREDCO, Chuck assumed a new role as Executive Vice President and General Manager at CSS, Inc., performing at his usual high level of achievement until he joined us at NCS. As Senior Vice President and COO at NCS, Chuck's leadership provided the IT and Operational support that enabled NCS to reach a new level of national prominence as a provider of risk mitigation services for benefit providers such as mortgage lenders. New services that offer solutions to income, identity, and other risk areas are now supported by an innovative, fast, and reliable “Chuck Burke support team.” These include new web-based, customer-facing verification capabilities that enable enhanced management tools that are not only significantly faster and more reliable, but can be customized to provide full-service risk mitigation across all channels. Another benefit of Chuck’s significant participation in the NCS leadership group is the company’s ground breaking role with the IRS and MBA and the resulting IRS agreement to embrace electronic signatures and other automated services that enable faster, safer lending decisions and better consumer services. Last Tuesday, May 7, 2013, with his wife Tina at his bedside, Chuck Burke passed away at home following a hard-fought battle with cancer. He is survived by his daughter Ryan and son Matthew. Last year Matt joined the NCS team and had a chance to work alongside the man who inspired us all. Chuck will also be remembered for his personal passion to consistently nurture his personal and business relationships. He worked hard at this and will be fondly missed by all who benefited from knowing him. From his Sunday tailgating at the Eagles games and his many other off-work functions, his passion for sports was well known. From his “Special Treat Fridays,” that included morning “Philadelphia” pretzels, to his genuine love and excitement to be at NCS each day, will long be remembered. Friends and colleagues of Chuck are invited to visit his memorial page and leave a personal message for the family, or make a donation to the Abramson Cancer Center at the University of Pennsylvania, the charity he chose.